First of all, apologies for not posting for months. I’m taking a diploma in life coaching and all I’ve been reading are coaching books. Some of which have been excellent. 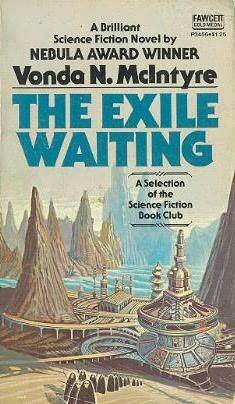 I read The Exile Waiting by Vonda McIntyre some while ago and I enjoyed it a lot. The story has stuck with me. Humanity has long since spread into the stars except for a remnant population on Earth. The surface of Earth is storm-torn and unlivable and a small city scrabbles a poor living underground. Mischa is a thief, struggling to steal enough to satisfy her uncle who controls her through torturing her telepathic, mentally disabled sister. It’s doubly hard once her brother is lost to the drugs he uses to block out their sister’s psychic cries. But Mischa has a plan to get off Earth. It involves the ship that arrives carrying genetically modified twins set on removing the ruler of Center and establishing their own power base there. One of the twins finds himself separating from the other, thinking independently, disagreeing, wanting something else. This independence sets brother against brother. This is a beautifully realised world with layers and depth. I particularly enjoyed the twins, their relationship and their eventual separation. The exquisite pain of growth is well captured. The loss of what one had, the gradual acceptance that what was can never be again, the pain of growing towards something unknown. I loved the hard choices Mischa has to make. I’m growing to be a fan of Vonda McIntyre. Fortunately, book mountain has a few more of her titles in there.